‘Julian Assange has done nothing wrong as he faces into what would amount to house arrest on the long term duration nearing seven years in the Ecuadorian Embassy in London. Initially the Ecuadorian Government was sympathetic to his situation though subsequently with a change of leadership in the Equadorian Government he is now under armed guard in completely restricted circumstances. In the era of fake news we ask that you sign this petition demanding the freedom of one of the premium truth tellers of our time. We are encouraging all to stand in solidarity with our friend Julian Assange, Editor in Chief, of Wikleaks. Because of Wikileaks reporting of acts during US/Nato’s illegal wars against Afghanistan, Iraq, etc., and its highlighting of corruption by USA/CIA and Corporate power, and continuing his fight in disclosing the links between the great private corporations and government agencies, Julian Assange has been threatened by high profile USA citizens, and a Grand Jury has been set up in American to try Julian Assange and Wikileaks, for their publications. For this, he is being persecuted and deprived of his right to liberty, human rights, etc., Six years ago Julian Assange, aware of these extradition plans of America, sought asylum in the Ecuadorian Embassy, in London, where he remains today. 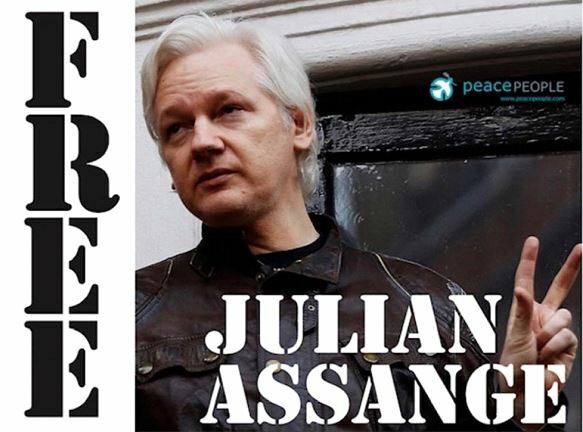 (He is now in his 8th year of Arbitary Detention in the U.K.) Although Mr. Assange’s conditions were already harsh, having no sunlight or outdoor exercise since June 2012, his situation has gotten worse since March 2018 when the Ecuadorian Government (after a visit by UK/USA officials to Ecuador) imposed conditions that are like indefinite confinement. He is prevented from having visitors, receiving telephone calls, no internet, emails, or other electronic communications. He is unable to speak to his lawyers except in person and his physical health, according to Doctors, continues to deteriorate. Julian Assange is unable to walk outside the Ecuadorian embassy, as he has been told by UK government, he will be arrested by the British Metropolitian Police. He has asked UK Gov. to give assurances he will not be handed over to American Security for extradition to America, to face a grand Jury, where he could be tortured and face life imprisonment, but UK Gov., refuse to give him assurance of this. A UN working group on Arbitarary detention has deemed this an arbitrary depreviation of his liberty and a grave human rights abuse which should be ended immediately, and for which, according to this UN Group on Arbitary detention , he ought to be compensated by Britain and Sweden. We should all be deeply concerned at attacks by Governments, on ’truth’ tellers and ‚’whistle-blowers’ as this is a danger posed to our democracy, security and good Governance when ‚whistle-blowers’ are thus persecuted. These matters of removal of basic rights of speech, information, liberty, persecution and silencing of journalists, etc., are of fundamental importance to all of us who believe in a free and democratic society. l) Ensure Julian Assange is guaranteed full and timely access to all necessary medical and dental care 2) Request and defend his right to receive informaton and impart information freely without interference by any public authority; 3) Defend Mr. Assange at home and abroad and object to threats levelled against Mr. Assange by high-profile US citizens and others 4) Strongly oppose and refuse, any application to have Mr. Assange extradited to the United States where it is unlikely he would receive a fair trial. 5) Facilitate the exercise of his right to freedom of movement in an expedient manner . 6) Compensate him for his arbitrary detention. (Also the Swedish Government should compansate him for his arbitrary detention). I would like to make a special appeal to the American President DonaldTrump and his Government, to close down this Grand Jury which has been established to try Julian Assange and Wikileaks based on their publications , and confirm the US Government will not extradite him to America, but recognize that he too, (as any American Citizen, ) has a right to have his rights protected under law. This impasse could be resolved through Mediation between Ecudorean Embassy and the UK Government. A text which includes a confirmation that Julian Assange will not be extradited to America and his Civil and Political Rights will be upheld by all Parties, would mean Freedom for Julian Assange. The case of Julian Assange and Wikileaks is deeply important to not only journalists, media, etc., but is of fundamental importance to a free and democratic society for us all. We owe Julian Assange our deepest thanks for his courage and being prepared to tell the truth even at risk of his own liberty and life. We can all, especialy the media, and Governments, refuse to be silent in face of such injustice and persecution of a man whose only crime was telling the truth to stop the wars and save lives. We can refuse to be silent and thus complicit in the face of injustice and work together until Julian Assange can return in safety and freedom to be with his family in Australia, or whatever country he chooses as a free citizen of the world.